Comments: Why this name? 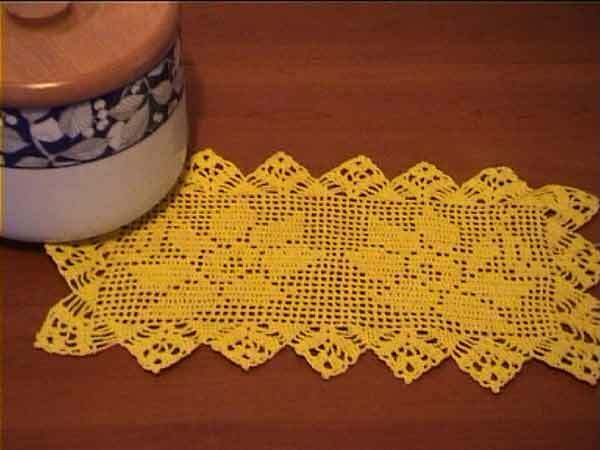 Because I do not know the name of these flowers in English :) The border is elaborate, but you can apply another edging if you want an easier pattern (E.g., like that of Filet Doily). Another modification you can do is to make another two flowers in a symmetrical way, and you will have a nice runner. 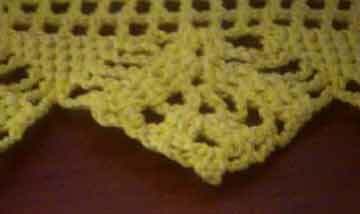 Material :Pearl cotton # 5, hook 1.6 mm (Boye steel #7) ; you can substitute with bedspread size thread or equivalent (but the gauge can slightly vary) you may want to give a look to my virtual store if you need materials. Row 1.Dc in 8th ch from hook (7 chs = 2 ch + dc + 2 ch), *ch 2, sk 2 ch, dc in next ch* Repeat * to * 53 times more: 55 empty squares. 1. *[(2 dc, 2 ch, 2 dc) in corner, 6 ch, sk 2 blocks, *(sc in next dc or ch) 9 times, 6 ch, sk 2 blks, (2 dc, 2 ch, 2 dc) in next blk, 5 ch* ; Repeat * to * 5 times, sk 2 blocks, (sc in next dc or ch) 9 times, 6 ch, sk 2 blocks, (2 dc, 2 ch, 2 dc) in corner, 6 ch, repeat * to * 2 times, sk 2 blocks, (sc in next dc or ch) 9 times, 6 ch, skip 2 blocks] ; Repeat [to ] on the other 2 sides; Join with sl st in first st.
3. *(dc in next dc) 3 times, 3 ch, (tr, 3 ch, tr) in corner sp, 3 ch, (dc in next dc) 3 times, 6 ch, + sk a sc, (sc in next sc) 5 times, 4 ch, sk a sc, (dc in next dc) 3 times, 3 ch, (tr, 3 ch, tr) in next sp, 3 ch, (dc in next dc) 3 times, 4 ch+ Repeat + to + along the side, sk a sc, (sc in next sc) 5 times, 6 ch* Repeat * to * all around; Join with sl st in first st.
4. *(dc in next dc) 3 times, 3 ch, sk a sp, sk tr, ( 3 tr, 3 ch, 3 tr) in corner sp, 3 ch, (dc in next dc) 3 times, 5 ch , +sk a sc, (sc in next sc) 3 times, 3 ch, sk a sc, (dc in next dc) 3 times, 3 ch, (3 tr, 3 ch, 3 tr) in next sp, 3 ch, (dc in next dc) 3 times, 3 ch+ Repeat + to + along the side, sk a sc, (sc in next sc) 3 times, 5 ch* Repeat * to * all around; Join with sl st in first st..
5 *[ (dc in next dc) 3 times, 3 ch, sc in next sp, 3 ch, sk a tr, (tr in next tr) 2 times, ch, picot, ch, (2 tr, ch, picot, ch, 2 tr) in next 3-ch sp, (ch, picot, ch, tr) in next 2 tr, 3 ch, sc in next sp, 3 ch, (dc in next dc) 3 times], 5 ch, + sk a sc, sc in next sc, 3 ch, (dc in next dc) 3 times, 3 ch, sc in next sp, 3 ch, repeat [ to ] 1 time, 3 ch + ; Repeat + to + along the side, sk a sc, sc in next sc, 5 ch* Repeat * to * all around; Join with sl st in first st. Cut thread.